In the near dystopian future, the majority of the nation is in ruins. What is left is a congested mega city of overflowing crime and disorder. Those who are fighting the losing battle are the judges: officers upholding the law and carrying out instant sentencing at the scene of the crime. Among these enforcers lies Judge Dredd, a weathered and experienced veteran. He is paired with a fresh rookie who has psychic powers. This film follows Dredd's assessment of rookie Anderson's ability to become a judge. In tradition of Paul Verhoeven's best action films of Robocop and Starship Troopers, Dredd delivers pulpy characters with plenty of ultra violence. Dredd, the character himself, is a no nonsense, by the book badass. 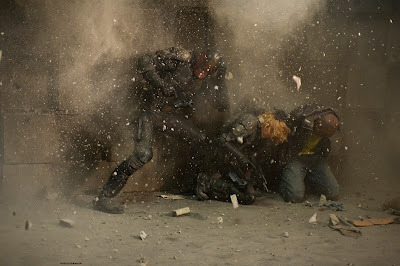 Karl Urban, sporting a Clint Eastwood inspired voice (the comic book character was partly based on Dirty Harry) and extremely dry humor, plays Dredd in every way better than the campy performance by Stallone seventeen years ago. The rookie (Olivia Thirlby) is written in as a good counterbalance to Dredd's coldness, and eventually becomes the emotional center for the audience. The talented cast is rounded out with a notable performance from Lena Headey as Ma-Ma, the predatory drug kingpin. Other than the well composed slow motion visuals, clear action staging, and efficient plotting, the dynamic between Anderson (the rookie) and Dredd touches on interesting character study. 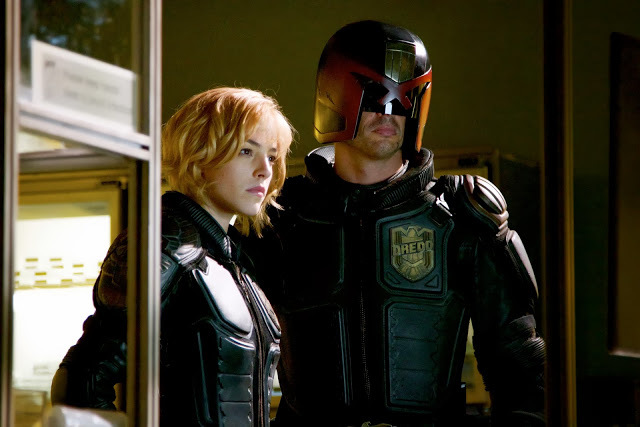 Dredd on one hand follows the law down to the last detail without batting an eye. Anderson holds more empathy towards others and questions the morality of the instant decisions a judge has to make. 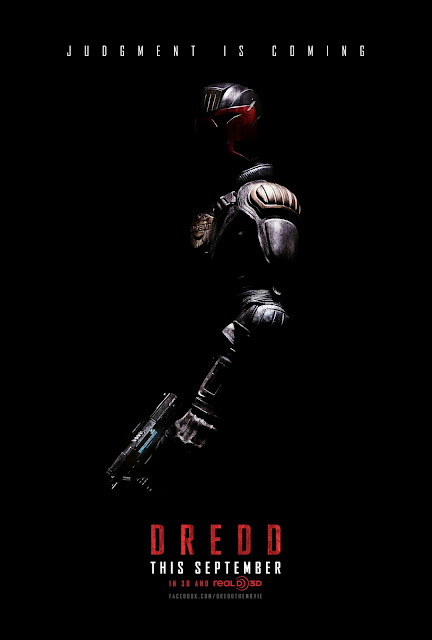 Unlike the majority of 3D released movies, Dredd is definitely one to see with a pair of glasses in front of a big screen. The movie stands solid on the 2D screen, but was designed to be seen with depth. Every single shot carries much more beauty and intensity in the third dimension, from the opening title to the dropping finale. This film did not perform well to expectations in the box office, but hopefully its cult following will sway backers to make a Dredd Sequel. Some parts I felt like Oseen The Raid or Die Hard, a sense of deja vu.